Do you grind or clench your teeth at night? If so, you’ll want to schedule an appointment with your Troy dentist as soon as possible to discuss getting a teeth grinding guard. People who grind their teeth at night often wake up with sore jaws and headaches. If left untreated, teeth grinding (also called bruxism) can wear down tooth enamel and contribute to TMJ disorders. If you suspect you have bruxism, you’ll want to keep reading to learn how night guards stop teeth grinding. People who have bruxism grind their teeth at night, sometimes loud enough to wake up their partner. Since most of the teeth grinding happens while you’re asleep, you may not even know you have bruxism until your dentist spots the signs during your routine dental exam. Getting a night mouth guard protects your teeth and jaws from bruxism and saves you money in the long run. It’s not uncommon for patients to need crowns, veneers, or other dental restorations if teeth grinding isn’t addressed as soon as possible. The force from grinding your teeth not only overworks your jaw muscles, but can damage your teeth over time. A bruxism mouth guard is an oral appliance you wear while you sleep that forms a protective layer between your upper and lower teeth. 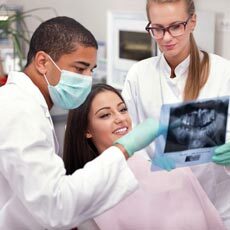 During your first dentist appointment, your dentist will take impressions of your teeth and send them to the lab where your dental night guard will be made. When you come back for your second appointment, your dentist will make any final adjustments to your night guard so it fits properly. Your dentist will also make sure that your nighttime mouth guard allows you to breathe easily and fits comfortably. A night guard for teeth grinding is the best way to protect your smile from bruxism. The night guard forms a protective layer between your upper and lower teeth so that you can’t clench your jaw and cause damage to your smile. A bruxism guard will help get rid of the headaches you’ve been experiencing as well as any pain or discomfort from your jaw or teeth. After you’ve been wearing your night guard for a while, you should also notice an overall improvement in your quality of sleep. If you are under a lot of stress, you may have difficulty with trying to stop teeth grinding on your own. The moment you suspect you have bruxism, you should schedule an appointment with your dentist to discuss getting a night guard to relieve your symptoms. Dr. Kelly Giera DDS and her staff at Mosaic Dental are dedicated to helping you maintain a beautiful healthy smile. If you are interested in getting a sleeping mouth guard, schedule an appointment with our dentist in Troy, MI at (248) 528-2270.